They have a long and massive dead-bolt. As many as 6 throws may be needed to close and open them. When you use them they make a noise very similar to that of bank vaults in action films. Yet, in spite of all this, they don’t provide high security. We are talking about certain types of rim door locks, which are known in Italian as “ferroglietti”. Let’s have a look at them. The dead-bolt of the ferroglietto rim door lock is typically (though not always) actually quite strong; the problem is that poor quality products are fitted in a case which is, on the other hand, very weak from the mechanical point of view. They are made with very thin steel sheet, bent and joined together with just a few welding points. In order to provide more strength, the case and the striker plate must, on the other hand, be made of a pressed shell (using the drawing process) without cracks or joints. Added to this is the fact that a thin steel sheet not only weakens the lock but tends to puncture if an attempt is made to weld it, and it is not therefore possible to fix the ferroglietto rim door lock by welding, which is the securest way on metal doors. For this reason, the rear fixing plate of the lock and the striker plate of the Viro ferroglietto rim door locks have a greater thickness: 1.8 mm when most products on the market have thicknesses of between 1 and 1.5 mm. 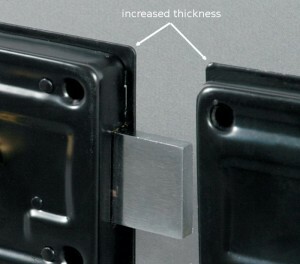 The Viro ferroglietto rim door locks are made from thicker steel sheet. The other weak point of ferroglietto rim door locks is the internal mechanism for disengagement of the dead-bolt, which allows it to be easily opened from the inside without keys, simply by lifting a knob and pulling the dead-bolt. The problem is that this knob can also be operated from the outside, simply by drilling a hole in the door (or using an existing slot) in which to insert a small hook with which to grab and pull the knob upwards to unlock the sliding of the dead-bolt. 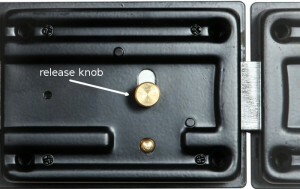 The inside knob can also be hooked from the outside, by drilling a small hole in the door. For this reason, if the door is locked from the inside and you want to prevent it (e.g. 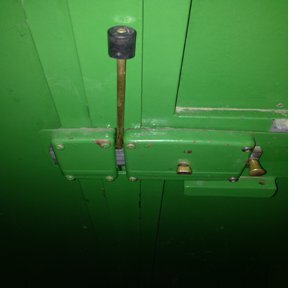 at night time) from being opened from the outside with the key or with the above-mentioned technique, it is advisable to insert a steel pin in one of the upper holes of the dead-bolt, in order to stop it sliding. 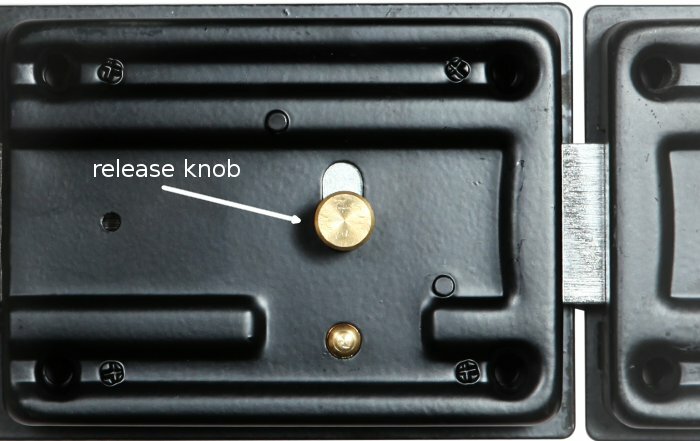 In this way, the door can be re-opened only from the inside after having removed the pin. Example of a ferroglietto rim door lock locked from the inside with a pin inserted in one of the holes of the dead-bolt. The most common ferroglietto rim door lock is fitted only with the dead-bolt, but there are also versions where the dead-bolt also serves as a latch. 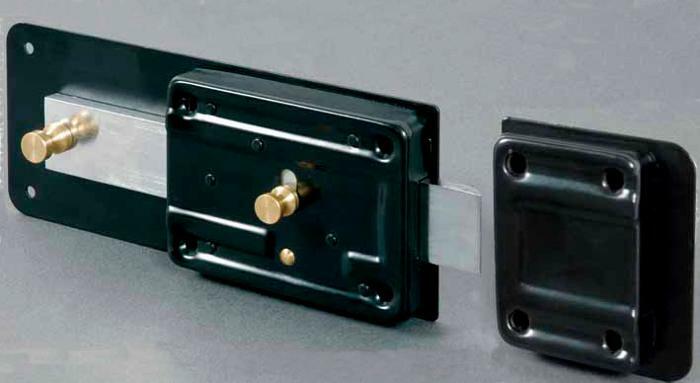 This enables you to close the door only with the latch simply by moving it near. In these models the first half throw controls the latch, whilst the next 5 and a half throws control the dead-bolt. Ferroglietto rim door lock with the initial part of the dead-bolt, controlled by the first half throw, which acts as a latch. The ferroglietto rim door lock is a cost-effective solution which can be adopted when a high level of security is not required. In all other cases it is better to use a good quality manual lock, which, although smaller and with less throws, actually provides greater security guarantees. This entry was posted in Locks and Cylinders and tagged products on 16 December 2013 by Mara Rossi.